When DJ Buddy got an energetic testimonial from the happy couple, he forgot to press record. Oops. Fortunately, Nick and Michelle were so thrilled with us, they e-mailed Buddy from their honeymoon at Disney World. Congratulations and a special THANK YOU! DJ Buddy Rocks The House! 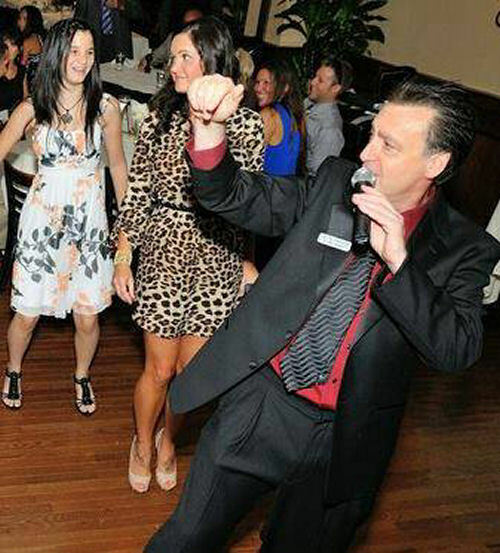 We got a candid of DJ Buddy rocking a happy crowd at a recent party! Let us do the work in entertaining–all you need to do is show up to have fun! Have you checked out our website and liked us on Facebook yet? Don’t ask us–Let Denise and Jordan tell you. Let’s Party! DJs are the most fun and will keep everyone dancing! At Lighthouse Point Yacht and Racquet Club in Lighthouse Point, FL. When Let’s Party! does a Bar/Bat Mitzvah, your family are the stars of the evening! Our entertainment is family friendly and our prices easily fit within your budget! Call (561) 251-0810 or email info@letspartydjs.com and start planning your teen’s special day today! Stressed? Overwhelmed? Biting your Nails? Don’t be afraid to hire a Day-Of Wedding Planner! Experienced Planners help ensure everything goes smoothly on your big day, working with your vendors, so you can breathe… and save your manicure! The Most Important Part of Your Wedding Besides YOU! The answer is NO, NOT EVER. On a per-person basis your DJ/MC is one of the least expensive, but most important parts of your day. Hopefully you have a wedding only once. A good DJ/MC often has them over 100 times PER-YEAR. It’s important you choose experience, professionalism, a proven track record, and a degree of recognition in the industry. It’s easy to find someone with a “great music collection” and “really neat equipment.” There’s plenty of it dirt cheap on Craigslist listed by recently out-of-business “inexpensive” DJs. Chicken, String Beans, Bar Reception Venue Bar with Tax/Service is OVER $14,000 that’s $140.00 per person! Centerpieces – Average in 2011 – $2,000! At 10 tables, that’s $20.00 per person! Photography – while important – few people see it! $3,000 – that’s $30.00 per person! An average South Florida DJ may be $800 – $1,000, while a “higher” priced South Florida Wedding DJ may be $1,200 – $1500” for 4-6 hours. A GREAT DJ/MC is ONLY $8 – $15 dollars per person!! This is not a day to “take chances.” Cut back on carrot sticks, chair covers, or the valet parking. The right DJ/MC will unquestionably make the difference between a great event or a bad one! South Florida’s most requested Wedding DJ entertainment. Congratulations to Danielle and Jeff and thank YOU Jeff for serving our country! DJs Buddy and Sandy enjoyed entertaining the couple at the Madison Green Country Club in Royal Palm Beach. Let’s Party does Quinceaneras too! Se habla Espanol! We rock quinceaneras too! Music, lighting, photos, and video–we do it all! Call us today at (561) 251-0810 and ask for DJ Xavier.